Say hello to your favorite applications on XAMPP. Quickly install dozens of Bitnami Modules on top of the XAMPP server stack. 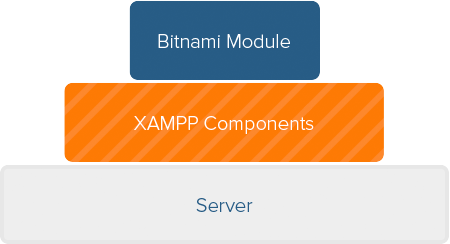 Bitnami Modules can be easily installed on your XAMPP server stack. Bitnami Modules are production-ready packages of the most popular open source applications, available in the widest variety of formats. Dozens of Bitnami open source applications can be quickly and easily installed on top of your XAMPP server or deployed in the cloud — for a broad range of use cases from blogs to ecommerce, business automation to eLearning. By using a Bitnami package, you'll get the added benefits of optimizations for performance, the most up-to-date releases, and security patches as soon as they're available. Get started by selecting a Bitnami Module for XAMPP below. 25 Bitnami Modules for XAMPP and counting. Click on an app to start your download, then follow the installation instructions. OS X native modules have been deprecated. Please use XAMPP-VM for OS X and the Linux version of the add-ons. Check XAMPP FAQs for more info. Deploy Bitnami apps in the cloud. Bitnami Cloud Images are easy-to-use like Bitnami XAMPP Modules, but offer additional scalability benefits native to the cloud. Select a Bitnami cloud partner above to view their limited-time introductory offer!